Bangkok, the capital of Thailand is fast becoming a favourite outdoor spot for Kannada film producers to shoot their songs. There is even a Kannada film titled Bangkoknalli Friends (Friends in Bangkok) joining the growing list of films shot there like Thamaashegaagi, Ganga Cauvery, Mast Majaa Maadi, Deadly Soma, Maadesha, Rocky and Gulama. Recently a 50-member team of two Kannada films was in Bangkok. One was Mahesh Babu's Abhay starring Darshan and the other Maadesh's Preethse Preethse starring Yogeesh-Pragna. The two songs one for each film -- Preethse Preethse and Abhay -- were shot near Pattaya and Bangkok. "When we were there, we heard about some kind of protests where buses and other vehicles were burnt. Our agent, however, told us that the protesters would not disturb the shooting, as the locals know that the country is benefiting from the shooting of Indian films. "We started shooting immediately after we landed in Pattaya and found that there was no disturbance during our shooting. We did not find any protestors or policemen. 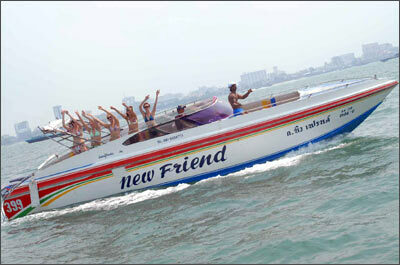 None of the residents of Pattaya disturbed us," Maadesh said. Kannada film producer Anaji Nagaraj has become an expert in advising other producers on how to shoot efficiently in Bangkok and also the best locations to choose. "I started shooting in Bangkok from my first film Shashtri. Then I took my unit again to Bangkok. Two songs of Mast Majaa Maadi were shot there. I think shooting in Bangkok is easy as people in Thailand are very friendly and co-operative," said Anaji Nagaraj.